DAYTONA BEACH, Fla. - The Tortugas are pleased to introduce Justin Rocke as the new play-by-play broadcaster for the 2019 Daytona Tortugas season. Justin Rocke joins the Tortugas staff after spending the previous five seasons with various affiliated minor league baseball clubs. Reds fans will enjoy hearing a familiar voice as Rocke most recently was the play-by-play broadcaster and media relations manager for the Greeneville Reds, Rookie-Affiliate for the Cincinnati Reds. Following the 2018 season, Rocke was named the Appalachian League Broadcaster of the Year. Rocke stated that "I am tremendously excited and honored to be named as the next voice of the Daytona Tortugas. Getting a chance to work with a top-flight organization like Daytona is a wonderful opportunity. Additionally, I get to stay within the wonderful Cincinnati Reds' organization. I cannot wait to continue the impressive legacy of the great broadcasters who have called 'The Jack' home over the years." Rocke returns to the Florida State League after working with the Brevard County Manatees throughout the 2014 season. Rocke spent the following four seasons with the Boyd Sports Group, two with the Tennessee Smokies, one with the Johnson City Cardinals and his most recent stint with the Greeneville Reds. Rocke is excited to join the Tortugas staff and provide a call for all 140 Tortugas home games on the Tortugas Radio Network. The Fort Lee, NJ native graduated from Penn State University in 2014. Team President Ryan Keur mentioned "we're excited to welcome someone as enthusiastic, passionate and talented as Justin to our organization. Fans are really going to enjoy listening to him call Tortugas games and the energy that he'll bring to our club. During one of our initial conversations, I made the bad pun that he was going to be a Rocke-Star and now it's time for him to live up to the name." The first chance to hear Justin Rocke call a Tortugas game will be Exhibition Game at Jackie Robinson Ballpark on Tuesday, April 2nd. 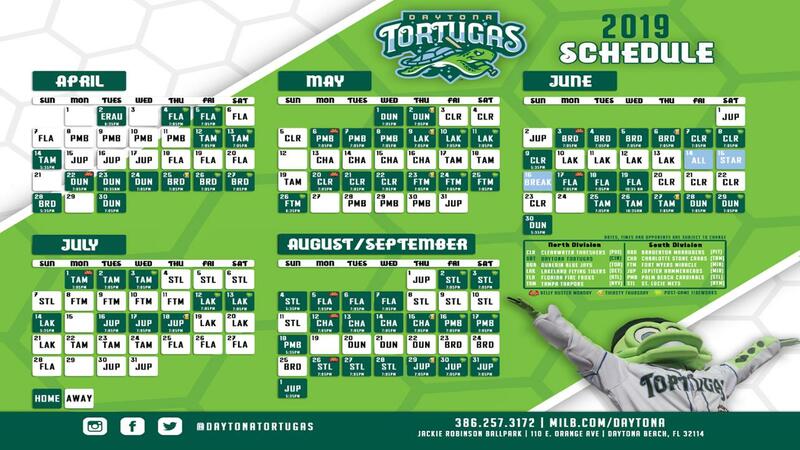 Daytona Tortugas Opening Night is slated for Thursday, April 4th against the Florida Fire Frogs at 7:05. Call (386) 257-3172 to purchase your ticket packages or to host a group night at the ballpark now! Individual game tickets go on sale on Friday, March 1.